London Design Festival has announced its 2014 programme, which includes a Drone Aviary, an ambitious Barber Osgerby installation and the return of a Trafalgar Square headline installation. LDF has sought new sponsorship deals to make its landmark installations possible this year according to LDF director Ben Evans. This year headline installation A Place Called Home in Trafalgar Square will see Jasper Morrison, Patternity, Raw Edges, and Studioilse design four separate installations in collaboration with Airbnb. The designers will create their own evocations of a room which you would not want to leave, according to LDF. Studio Ilse founder Ilse Crawford says, All of us are going to visualise an immersive experience of home and express a contemporary idea of a home for everyone. 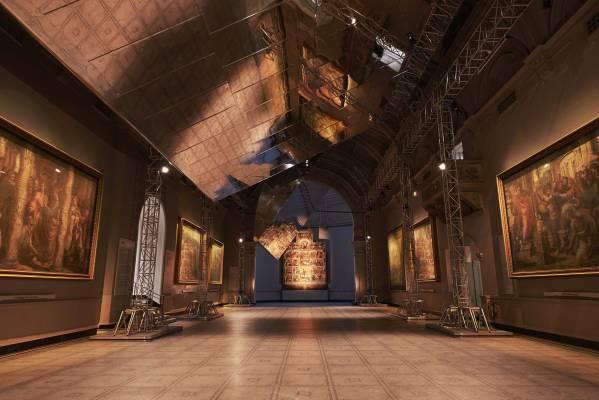 At the V&A, Edward Barber and Jay Osgerby have teamed up with BMW for the project Precision & Poetry in Motion, which will turn the ceiling of the Raphael Gallery into a rotating reflecting surface. Inspired by aeronautical and car design the piece is concerned with the aesthetics of motion. Two huge structures concave on one side and flat on the other will spin slowly on their own axis in a choreographed movement designed to distort the view of the Raphael cartoons on display, the form of the room and the viewer perception of the space. Osgerby says that they are working with Arup on the engineering of the structures which will be powered by crane motors. The Drone Aviary by Superflux is being supported by Swarovski and public funding from the Arts Council England. 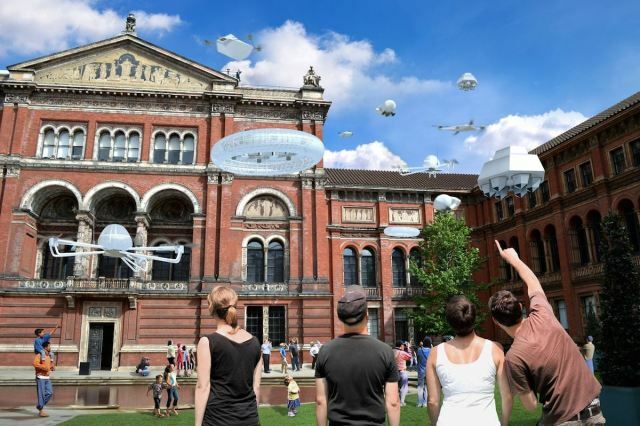 The V&A John Madejski garden will be turned into an interactive drone installation where the public can meet semi-autonomous creatures. Around a dozen drones will be designed and programmed with different behaviours allowing the public to see how drones interact with them, perform tasks and display their behavior in a safe and contained environment. New technology will be accompanied with advanced materials from Swarovski laboratories, including lenses, crystals and fibres. The context of the piece is an examination of associations with surveillance, and military use but also how drone usage is becoming part of everyday life. LDF hopes the piece will give a glimpse into future cities. A drone was flown inside the V&A this morning to demonstrate close proximity filming and face-recognition capabilities. Elsewhere, Alan Kitching has teamed up with Monotype to celebrate the centenary of five pioneers of the poster who were born in 1914. Kitching has created a homage to each of Tom Eckersley, Abram Games, FHK Henrion, Josef MÃ¼ller-Brockmann and Paul Rand, all of whom Kitching says he has encountered in his career. Kitching posters, which have been designed in the spirit of the designers they celebrate, will go on display at London College of Communication over the course of the festival. 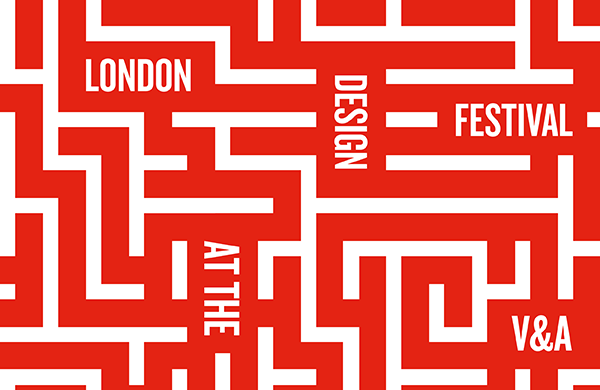 This year festival is being positioned around the theme Lose Yourself in Design and an accompanying festival identity has been designed by Pentagram partner Domenic Lippa who says, The maze graphic is a visual metaphor for the experience that visitors have when the visit the Festival and the city of London. The solution is deliberately both playful and memorable.